WONDER IS NOW A MAJOR MOTION PICTURE STARRING JULIA ROBERTS AND JACOB TREMBLAY! Over 6 million people have read the #1 New York Times bestseller Wonder--the book that inspired the Choose Kind movement--and have fallen in love with Auggie Pullman, an ordinary boy with an extraordinary face. 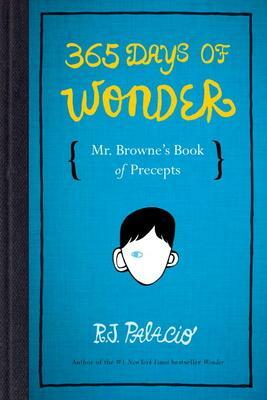 In Wonder, readers were introduced to memorable English teacher Mr. Browne and his love of precepts. This companion book features conversations between Mr. Browne and Auggie, Julian, Summer, Jack Will, and others, giving readers a special peek at their lives after Wonder ends. Mr. Browne's essays and correspondence are rounded out by a precept for each day of the year--drawn from popular songs to children's books to inscriptions on Egyptian tombstones to fortune cookies. His selections celebrate the goodness of human beings, the strength of people's hearts, and the power of people's wills. There's something for everyone here, with words of wisdom from such noteworthy people as Anne Frank, Martin Luther King Jr., Confucius, Goethe, Sappho--and over 100 readers of Wonder who sent R. J. Palacio their own precepts. "It's in the bigger themes that Palacio's writing shines. This book is a glorious exploration of the nature of friendship, tenacity, fear, and most importantly, kindness." "Full of heart, full of truth, Wonder is a book about seeing the beauty that's all around us. I dare you not to fall in love with Auggie Pullman." "Few first novels pack more of a punch: it's a rare story with the power to open eyes--and hearts--to what it's like to be singled out for a difference you can't control, when all you want is to be just another face in the crowd."